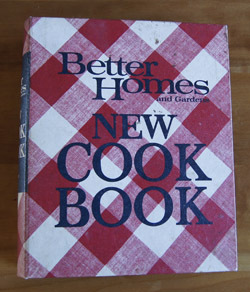 Cookbook #82: Better Homes and Gardens New Cook Book, Better Homes and Gardens, Meredith Press, NY, Des Moines, 1968. This is one of my mother’s basic cookbooks. By “basic cookbook” I mean it is the type of cookbook that encompasses all types of recipes and can serve as one of a cook’s core references. For instance, if you want to know how long and hot to cook a roast, or a fruit pie, or a vegetable, the answer is in this book. Such cookbooks tend to be less trendy than what I think of as specialty cookbooks. And, these cookbooks tend to remain useful over the decades. 1968: the publication date of Better Homes and Gardens New Cook Book. I graduated from high school in 1967. Thus my mother did not use this cookbook as a reference when I was a young child at home. But, the recipes certainly reflect the type of cooking I grew up on in my mother’s kitchen. Casseroles and one-dish meals, including chili con carne, enchiladas, macaroni and cheese, chicken divan, tuna casserole, hamburger pie, and goulash. Salads for a group, including frosted cheese mold, waldorf salad, coleslaw, five-bean salad, potato salad, ambrosia, and cran-raspberry ring. Other chapters include appetizers, barbecues, breads, cakes, candies, canning, desserts, meats, poultry and fish, soups, and vegetables. Mother marked several recipes in this book, including Potato Rolls (yeast rolls with mashed potatoes), Herbed Chicken Bake (wild rice, mushrooms, cream of chicken soup, pimientos), and Italian Salad Bowl (lettuce with raw vegetables, Italian dressing, and blue cheese). These recipes are similar to favorites of mine that I discovered on my own from other sources. But for me, the two treasures in this book are the peach and cherry pie recipes. These are her reference – her “work-in-progress” – recipes. On each she wrote notes as to how she made the pie and how to change it next time. 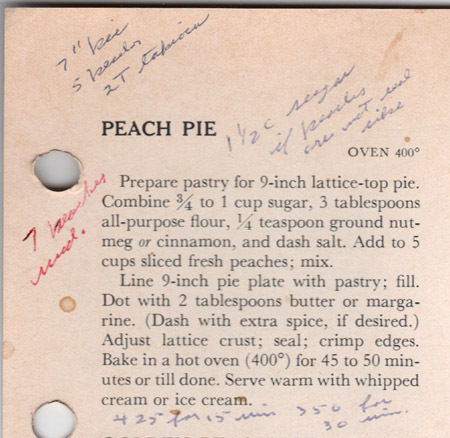 What tickles me is that she and I both came up with the same baking method for a peach pie – 425˚ oven for 15 minutes and then 350˚ for 30 minutes – rather than the reference directions of 400˚ for 45-50 minutes. Guess I am my mother’s daughter! Better Homes and Gardens New Cook Book is a ring-bound cookbook: the pages are loose-leaf, it opens flat, and you can remove and add recipe pages to it. Indeed, my mother cut a few pre-punched recipes from the Better Homes and Gardens monthly magazine and added them to the appropriate chapters in this cookbook. A nice idea to keep a cookbook current, but in reality, it kind of makes it messy. I decide to make “Deviled Swiss Steak”. 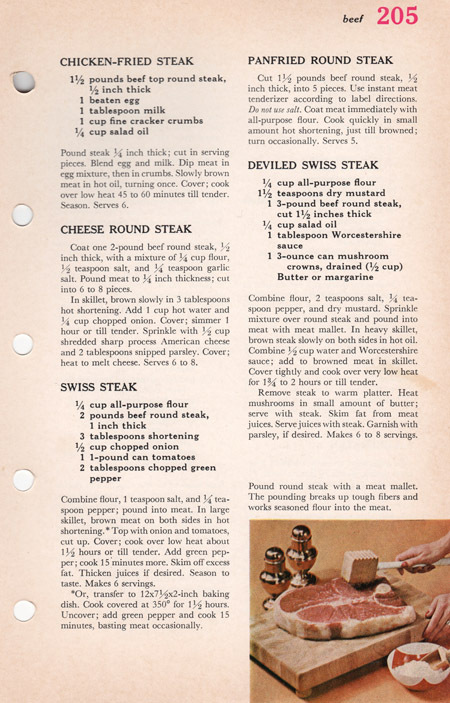 Swiss steak and salisbury steaks were popular ways to cook beef when I was in elementary school. My school is “Mrs. Salisbury Steak School”. I didn’t understand what I had said until years later. They tricked me into saying something I would never have come up with on my own. Ah, show business. So honest, so real. Back to 2014 and the recipe for Deviled Swiss Steak. It calls for a thick round steak. In my opinion, it’s hard to find good recipes for round steak. It can be tough if cooked quick and to medium rare, and it can be dry and tasteless if braised for a long time. This recipe holds promise because of the flavorful mustard and Worcestershire (Yes! I can spell it), the pounding with a mallet, and the gravy that should result after a long cook time. I decide to use my old cast iron pan to cook this Swiss steak recipe. It has a very heavy lid, and it’s hard to beat cast iron for braising. Cast iron pans are nearly indestructible (as opposed to my easy to clean but finicky non-stick cookware). I’ve had my cast iron pan since the 70s. I made a couple changes in the Deviled Swiss Steak recipe as I went along; below is my version of Swiss Steak. Heat a big heavy pan (choose one that has a close-fitting lid) and add enough oil to coat the bottom. Brown the steak on both sides. 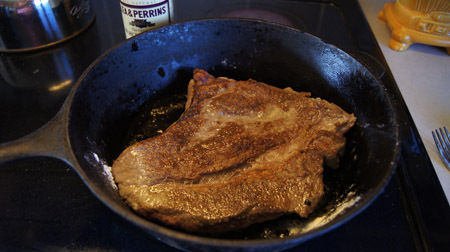 Combine the Worcestershire sauce with a half-cup water, pour carefully onto the steak, stir up a little, then cover and turn the burner to a low setting. Cook for 1 1/2 – 2 hours. Check occasionally and add water as necessary. It’s done when the meat is tender. Remove the meat from the pan. Scrape the pan juices and heat, adding water until there is about a cup of gravy in the pan. I wanted the gravy thicker, so I rubbed a tablespoon flour into a tablespoon of butter, dropped it in small pieces into the pan gravy, and stirred while heating until it was the thickness I wanted. 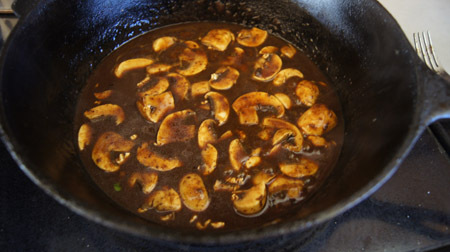 Add fresh (raw) sliced mushrooms to the gravy and heat just until the mushrooms are done. Slice the meat and serve with the mushroom-pan gravy. I found there was not enough gravy to serve this dish over rice or noodles, so instead I made twice-baked potatoes. This Swiss Steak was good, we both liked it. Not a “stellar” dinner, but a good, tasty, homey, and inexpensive weeknight meal. My round steak has a lot less fat than the one in the photo printed in the cookbook. Look at my mallet! I was my mother’s and I think it’s cool. And I like my old cast iron pan too. 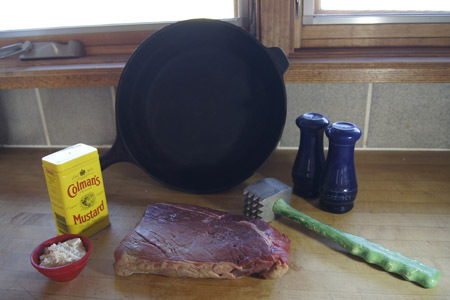 Below is the floured-pounded steak browning in the skillet. The steak cooking (above) is not very pretty. But look at the mushrooms cooking in the gravy! I consider this meal a success. And I’ll keep the cookbook, not only for sentimentality, but because I marked several recipes to try. Cookbook #81: The Tassajara Bread Book, Edward Espe Brown, Time-Life Books Inc., Shambala Publications, Inc., Berkeley, CA, 1970. “Bread makes itself, by your kindness, with your help, with imagination running through you, with dough under hand, you are breadmaking itself, which is why breadmaking is so fulfilling and rewarding. -Edward Brown, preface to The Tassajara Bread Book. A forgotten gem! 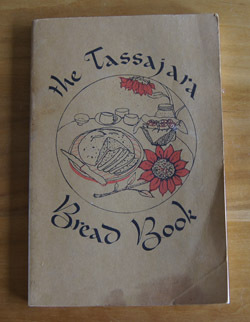 The Tassajara Bread Book speaks more to me today than when I bought it (used) sometime in the 70s. I have made thousands of loaves of bread since I last looked at this book, have used countless other cookbooks, and still I can learn from Edward Brown’s recipes. Or more appropriately, his “guidelines”. 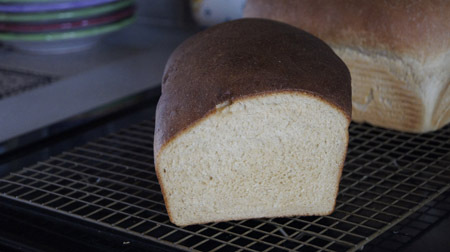 He offers a basic yeast bread recipe and then encourages the reader to improvise. This is right up my alley. I love to bake bread and I like to experiment with new ingredients. I believe that anyone who wants to make bread will become good at it. If you are new to breadmaking, get a book like The Tassajara Bread book, and go into your kitchen and settle in. Play with flours and grains and methods. Feel the dough beneath your hands. Experience the smell of fresh bread. Each loaf will be a new experiment, a unique creation, a learning experience. Yes you will have some failures. 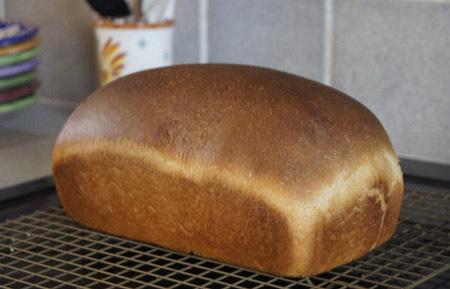 And yes, baking bread will tie you off and on to the kitchen for hours, mixing and kneading and waiting and punching down and waiting again and baking and smelling the aroma and taking a golden loaf out of the oven. But it’s worth it. I agree with Tassajara, breadmaking is time well spent for your body and soul. I admit that today I use shortcuts when I bake bread. I use a breadmaker to knead some doughs and I make no-knead breads that are simply mixed and left on the counter top overnight. Still, either way ii takes time to make bread and it takes some experience to know when a kneaded loaf is ready to bake. You have to get your hands in there and feel the dough to know when it’s right. I shared the feel of kneaded dough with my 8 month old grandson last week, let him push all ten fingers into the dough, let him feel the sensation . . . his intense eyes on his hands . . . the imprint of his hands in the soft loaf. Edward Espe Brown came to Tassajara, a resort in a valley in Monterey County, California, in 1966. At that time, Tassajara was a health spa, or as he describes it, an “exotic far-out place to imbibe liquor.” Brown washed dishes, learned to make bread and soups, and scrubbed the floors. When one of the cooks quit, he was offered the chef’s job, and in his words he “jumped right in over my head”. Later that year the resort was sold to the Zen Center of San Francisco and it became the Tassajara Zen Mountain Center, the first Zen center established outside Asia. Brown continued cooking at the Zen center and became a Zen priest in 1971. Later he helped found the Greens Restaurant in San Francisco, a landmark vegetarian restaurant. Today he lives in California and continues to teach baking and meditation to countless new students. He updated the Tassajara Bread Book in 2011 and according to Amazon reviews, this book is still highly popular. Brown touts the benefits of the “sponge method” for preparing yeast breads. A sponge is a mixture of water, yeast, and sweetener to which is added enough flour to make a thick and wet dough. This sponge is left to rise about an hour. This helps form the gluten which gives bread its stretchability, its soft and pliable texture. Why the sponge method? Because the very wet sponge-dough promotes the formation of gluten. The next step is to add more flour (and salt and oil) and knead it to a smooth loaf. The sponge step cuts down on the time the dough needs to be kneaded. I learned the technique of employing very wet doughs to develop the gluten when I learned how to make no-knead breads, but don’t normally combine wet-dough and kneading to form gluten. About half the book covers yeast breads, with first a full explanation of the general method and then 17 variations. Included are yeast loaves, rolls, fruited breads, and pastries. Unyeasted breads, quick breads, muffins, pancakes, and desserts make up the rest of the book. Whole wheat flour is the main ingredient in most recipes. The ingredients rye, corn, millet, barley, rice, oats and buckwheat are also encouraged. Sweeteners range from sugar to molasses to honey. I have always thought of my Tassajara cookbook as “one of those vegetarian cookbooks”, although it does not specifically promote a vegetarian diet. A web search reveals Edward Brown is, indeed, a vegetarian: he helped establish the vegetarian restaurant, Greens, and is a Buddhist priest (Buddhist cuisine is vegan or vegetarian). Thus I was curious to read the note on the recipe for “Apple Crisp” which reads “From the days of Tassajara barbecues – tossed salad, half chickens, pork ribs, French bread, baked potatoes, green beans, corn-on-the-cob, red and white wine.” Nice that he is not preachy. The Tassajara Bread Book a delight to read. Just like my favorite food blogger Molly, Brown encourages the reader to do “whatever you like” and to enjoy. Throughout are comments like the one in the above paragraph that make the book friendly and personal. I smile with each turn of the page. 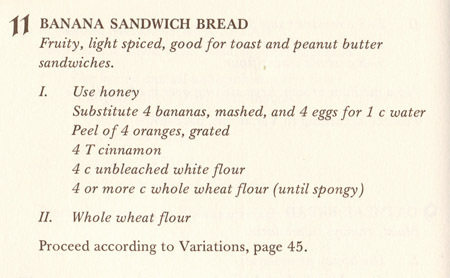 I decide to try Banana Sandwich Bread, one of the 17 variations of Tassajara yeasted bread. This makes 4 large loaves, and it’s just my hubby and me again (they took that cute grandson away!) so I decide to bake a quarter of the recipe. I don’t have an orange in the house, so I’ll have to skip that ingredient. I meant – I MEANT! – to hand-knead this bread, but after a couple turns of the dough I tossed it into the breadmaker. I sort of skipped reading “unbleached flour” in the original recipe, and instead I used almost solely white whole wheat flour (plus a little vital wheat gluten flour). My version is below. One more quick comment. Brown describes how to make yeast breads on pages 19-35 of The Tassajara Bread Book. I highly recommend novices and experts alike to read or re-read this section. Forty years old, but this cook book is still current because the basics of making yeast bread never change. Put the egg, banana, and a little water in a blender or food processor until the banana is mashed; then pour into a measuring cup and make the volume 1 1/2 cups with water. Pour into a large bowl and add the yeast, honey, and dry milk. Begin adding the flours, a little at at time, with stirring. When all of the flour has been added, the mixture will be thick but still beatable, kind of like mud. Continue to beat about 100 times until the batter is very smooth. Cover the bowl lightly and let rise about an hour. Fold the salt, cinnamon and oil into the sponge, then add the all purpose flour and mix in. Add the white wheat flour a little at a time, folding in until the dough comes away from the sides of the bowl. At this point, hand-knead until the loaf is smooth, probably 10-15 minutes. Set in a greased bowl, covered, in a warm place until double in bulk. Or, put it in a breadmaker set to a dough cycle that both kneads and rises the dough. 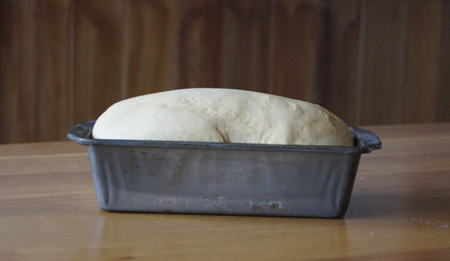 Punch down the risen dough and form into a loaf that will fit into a 9×5-inch loaf pan. Let it rise just until it’s a good half-inch above the sides of the pan. Bake at 385˚ for 30 minutes. Isn’t it a gorgeous brown color? That’s largely due to the honey. This loaf is not as dense as most nearly 100% whole wheat breads. I like to think that the sponge method helped give it a good density and texture (or was it the banana?). I was kind of disappointed that this bread did not have a huge banana flavor. Still, I would make it again! It made great toast and peanut butter sandwiches!